All our beds are computer-designed and painstakingly handcrafted. Each product gets the complete and individual attention it deserves. 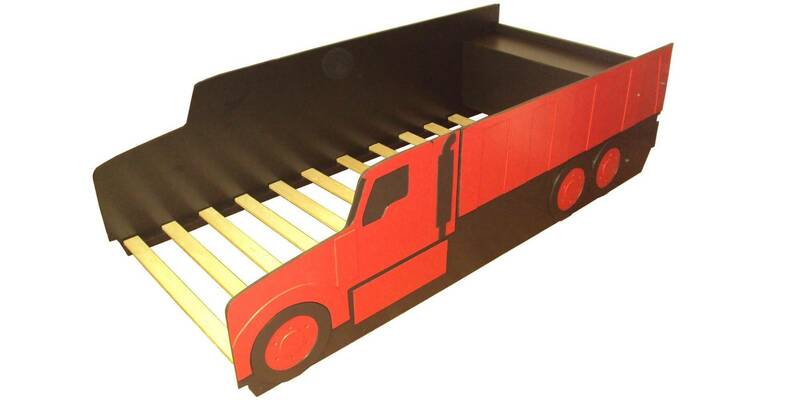 Designed to be durable and lightweight-- we do not use any dense, heavy MDF (medium density fiberboard) in our products. MDF also can contain glues or other chemicals that we avoid. We strive for safe design... because we are parents too. Designed around standard mattress sizes, no box spring is required as the wooden lateral supports create a solid structural surface to bear the mattress (mattress not included). With a lightweight frame and mattress support system, our beds have a perfect height for changing sheets and entry/exit. A full instruction manual is included with each bed. We design our beds to be as compact and space-saving as possible. Many of them take only a little more floor space than the mattress sizes they are designed to fit. Our designs are always kept as simple as possible for ease of assembly. Side panels come fully assembled, and attaching the headboard and support slats takes little time or skill (accessories or add-on kits may change this). Children deserve the best start they can get in life. Our beds are designed by parents, to whom the safety and security of their children are always paramount. -We use only zero-VOC, low odor paint. According to the Environmental Protection Agency, VOCs (Volatile Organic Compounds) can cause respiratory, skin, and eye irritation; headaches; nausea; muscle weakness; and more serious ailments and diseases. VOCs are present in most paints and stains, and affect the indoor air quality of your home. We also use only non-toxic wood glue. -The raised sides of the bed help prevent children from accidentally rolling out. -Low mattress height. By eliminating the need for a box spring, the top of the mattress can be about one foot from the floor, making it simple for your child to enter the bed themselves, in addition to allowing easy access for changing sheets. 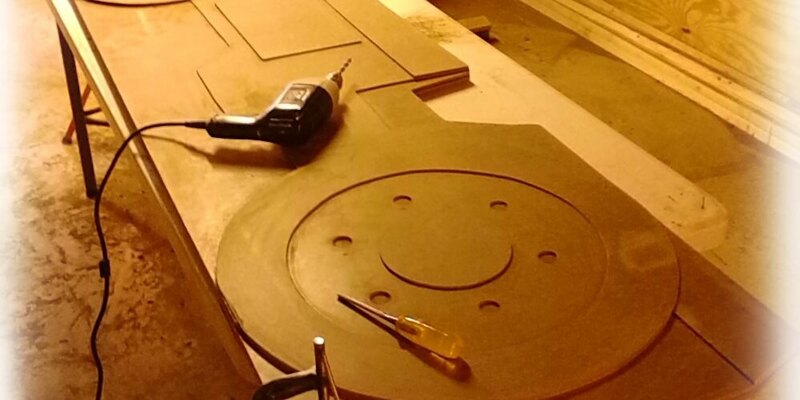 -We chose a tempered hardboard material for our panels because, unlike other composite wood panels, no formaldehyde-based resins are used to bind the wood fibers together; just steam and pressure. Linseed oil is used to create a smooth final surface. Although rare, it is possible to have an allergy to linseed oil (just like peanut and soy oils). This may cause a runny nose, sneezing, or in rare cases more fatal effects which can result in difficulty breathing or death. Please verify that you or your child does not have an allergy to linseed oil before using this product. -The tempered hardboard products used in our bed panels are made using recycled wood materials that might otherwise be discarded. This process saves trees and keeps landfills free of reusable products. It also contributes to our splinter-free design since there is very little wood exposed to the occupant (under normal use and proper assembly). -A large advantage of our tempered hardboard material is that it flexes slightly under pressure, then returns to its original form. Unlike stiff, hard materials like plywood or thick MDF (medium density fiberboard) used in many child beds, this flexing allows for additional safety if a child bumps into the side of the bed. -Our twin bed frame design is stress tested up to 500 lbs. occupancy weight (combined, spread weight of occupants under normal lying/sleeping conditions). We make every effort to keep our products and packages as lightweight and easy to transport as possible, however the total packaged weight of twin beds will be somewhere around 100 - 120 lbs. Full beds will be approximately 110-130 lbs. Packaged bed size will be approximately 91" x 28" x 8". Most beds will have lightweight crates built into the box for protection. We do our best to contribute to environmental conservation by reusing packing materials such as cardboard or foam where possible. We charge a flat shipping rate to cover all freight, packing, shipping and handling expenses. Packages are delivered directly to the address you specify. We will ship to residential or commercial addresses (please no PO boxes) located in the contiguous 48 states. Our freight is handled by the easiest carrier, usually UPS or FedEx. We also offer local delivery for a flat rate which is much lower than the standard shipping rate. Please contact us to determine if you qualify for local delivery. All local deliveries must be pre-approved. This service includes 'curb side' delivery only-- customer is responsible for any further transport and setup within the location or address. We ask that the customer be present to sign for and receive local deliveries. All products are delivered unassembled. Assembly instructions are included, and may also be conveniently downloaded from our website here: manuals Should your package be damaged during shipping, please notify us immediately and, if possible, take photos of the damage. We will make every effort to resolve your issue as quickly as possible. -Low or zero VOC (where possible), low-odor formula. -Excellent stain resistance (with children, spills are always just around the corner!). -Semi-gloss finish for good looks and easy cleanability. These are just some of the concepts we can bring to life. Choose one of these, or use one for the starting point of your own idea! There is no design fee for custom designs. There are some limitations to restrain manufacturing and shipping costs, and the final bed price and shipping cost will be based on many design factors. Contact us for pricing or more information. Many of our bed frames may be made in either twin or full/double mattress sizes. Because it's the right thing to do, we make every effort to be environmentally friendly. We re-use packaging materials whenever possible, and some of our materials for both product and packaging are made from already recycled materials. Our beds themselves are a good decision for the environemntly-concious because they are made from natural products like wood or hardboard that are biodegradable, while other beds made from plastic parts or synthetic materials just eventually end up in landfills where they will stay for the foreseeable future. Our shop operations are as low impact as possible for the environment, and we recycle or reuse wherever we can, because as parents one of our goals is to pass on a better planet to our children. For more on our conservation, environmental, and business philosophies see here.